Now heals allies for 33% of the heal’s original value, decreased from 50%. Bonus AD while shield is active decreased from 10/20/30/40/50 to 10/17.5/25/32.5/40 (this is a second PBE nerf, the live value isÂ 14/23/32/41/50). Cooldown increased from 8 to 9 [nerf compared to the value in this PBE update, live value is still 10 seconds at all ranks. Base Health decreased from 553 to 515. Base health buff increasedÂ from 200/350/500Â to 300/450/600 [revert on the change in this PBE update]. “Hunt” debuff noÂ longer roots jungle monsters. No longer resets Nidalee’s auto-attack timer. Once again resets Nidalee’s auto-attack timer [revert on the change in this PBE update]. The April Fools skins now have their splash arts on the PBE. From left-to-right: Definitely Not Vel’Koz, Draven Draven, Meowkai and Urf Kench. Bonus AD while shield is active decreased from 14/23/32/41/50 to 10/20/30/40/50. Now passively gives Kalista 9% [+1% per level] bonus Attack Speed when her Oathsworn ally is nearby. Base bonus to shield increasedÂ from 30/90/150/210 toÂ 30/100/170/240. Cooldown decreased from 10 seconds at all ranks to 8. Shield decreasedÂ from 80/105/130/155/180 [+0.35 AP] toÂ to 50/70/90/110/130 [+0.2 AP]. Triggering the Hunt mark on jungle monsters no longer roots them for 2 seconds. Check out the PROJECT skins for Fiora, Leona, Lucian, Master YiÂ and Zed! Six PROJECT icons have found themselves on the PBE;Â the latter five correspond to the recently released skins. [ Note] Fizz received changes to his [ W ] and [ R ] in this PBE update. PROJECT: Fiora will be available for 1350 RP. PROJECT:Â LeonaÂ will be available for 1350 RP. PROJECT:Â LucianÂ will be available for 1350 RP. Project Master Yi is a legendary skin and will be available for 1820 RP. PROJECT: ZedÂ will be available for 1350 RP. This ward skin will be available in store for 640 RP after Patch 5.17 hits live. If Draven kills 6 minions in a row without dropping an axe, he gains 2 extra Adoration stacks. [ Note ] A Rioter noted that this change is a bug. [ Reminder ]Â The PBE is a testing ground for changes. What you see here may not reflect what you see in Patch Notes. Remember that developers want your feedback so if you disagree with a change, you can always submit your thoughts on theÂ PBE Community Forums. Headhunter Akali’s splash art is here! You can find a full preview of the skin HERE. Default wards (no skins) now have their pillar placed on the ground, followed by the gem falling on top of it. No particles or effects. Second batch of texture updates! You can check the first one, which includes retextures for Janna and Taric HERE. 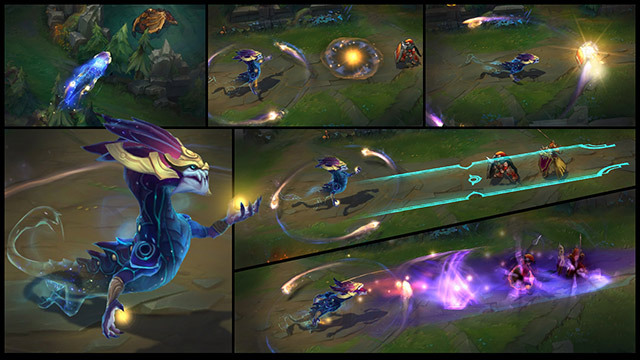 Kassadin’s base model has received a slight recolor. You can find previews of all his updated skins HERE. Ancient Chimes: Bardâ€™s presence causes sacred chimes to appear on the Fields of Justice. Collecting a chime grants Bard a brief burst of movement speed, experience, and mana. Chimes remain on the ground for 10 minutes. Meeps:Â Bardâ€™s presence attracts small spirits known as meeps to his side. Whenever Bard attacks, a meep throws itself at his target, dealing 30 (+0.3 AP) extra damage before disappearing back to the spirit world. As Bard collects more chimes, the meeps that follow him grow in both number and power. When Bard collects a chime, his running animation turns into a swirly flight. The locations of chines are marked on your minimap and the number of chimes collected and how many meeps follow you can be seen atop the UI bar. Bard fires an energy bolt, dealing 85/115/145/175/205 (+ 0.5 AP) magic damage to one or two enemies. The first target hit will be slowed by 60% for 1/1.2/1.4/1.6/1.8 second(s).Â If the bolt hits another enemy or a wall, any enemies hit are stunned instead (same duration). Bard raises a health shrine that immediately offers 30/60/90/120/150 (+0.2 AP) health, but restores up to 70/110/150/190/230 (+0.45 AP) health as it gathers power for 10 seconds. The shrine’s effect also grants 50% decaying movement speed for 1.5 seconds.Â Bard can have up to 3 shrines active at once, which remain until visited by an ally or crushed by an enemy. Bard opens a one-way corridor through nearby terrain. Both allies and enemies can use the corridor by right-clicking on any part of it while near its entrance, with allies travelling 10/20/30/40/50% faster than enemies.Â The corridor disappears after 10 seconds. Bard sends magical energy arcing to a target location. On impact, all champions, minions, monsters, and turrets in the target area are put in stasis, becoming invincible, untargetable, and unable to act for 2.5 seconds.Â Epic monsters are also put into stasis, despite normally being immune to disables. Elderwood Bard will be sold for 975 RP after Bard is released. He’ll also be available in a bundle together with the champion. For his recall, Elderwood Bard bows to his meep friends who bounce around him. Headhunter Akali will be available in store for 1350 RP after Patch 5.5 hits live. For her recall, Headhunter Akali fuses her kamas together, spins them and her suit is then covered with a pink grid. Secret Agent Xin Zhao will be sold for 975 RP. For his recall, Secret Agent Xin’s spear retracts into a briefcase. [ Note ] Inner MidÂ turrets no longer grant a shield or have shields of their own. You can view the PBE changes to turrets HERE. [ Note ] Grey Warwick, UrfÂ Warwick and Feral Warwick have received texture updates as well, but I don’t have access to them. [ ! ]Â Mordekaiser’s shieldÂ and damage changes from theÂ recentÂ PBE update have all been reverted. The health costs on his abilities have been increased, but are still lowerÂ than on live. The new mechanic on Creeping Death [ W ] is still there. No numbers on these yet! Items are still being implemented on the PBE. Click to Consume: Places an invisible blind sentry in a brush for 5 minutes. The plant will ping the map if a visible or invisible enemy is within 900 range. UNIQUE Passive: Gains charges upon moving or casting. At X charges, the next spell hit expends all charges to dealÂ bonus magic damage to up to X targets on the next auto attack. Passively increases your maximum Mana by X and generates stacks of Insight when spending mana, up to X stacks (X of maximum Mana). UNIQUE Active – Mana Burst:Â Releases a shockwave, consuming all stacks of Insight. Enemies hit by the shockwave are dealt X (+ AP)Â magic damage. Allies hit by the shockwave restoreÂ XÂ mana. Hey guys, we have a change coming soon to a PBE near you meant to help us improve our understanding of how people jungle (especially early game). When we tried to poke into some of the responses we got it became very apparent that people address the jungle in very different manners. Lots of small changes add up to huge swings in what champions look like coming out of their first clear. What this means for us is that it’s hard to balance early jungle without some more insight, so we’re calling on you guys to help. We’re putting a change that is PBE ONLY to help build this shared understanding of how junglers jungle individually: A set of buffs that track your jungle progress in the first portion of the jungle. By giving us a direct peak at how you interact with the jungle you give us a chance to improve it. Maybe by making a mechanic more clear, rebalancing a camp, or many other systems. But first this type of information would help us know which systems. The results of these after you tried it how you normally play the jungle. The results of these after you tried to optimize beyond what you normally do (possibly with the help of these buffs). I would want to make it toggleable if we were to do that. It’s not out of the question if there’s value in it beyond this gathering of data, just not right now since such a toggle would take a bit of work (so we would have to judge it versus other things as always). Note: these don’t try to figure out if a champion can “Jungle well” – there’s a lot more data than this required for that. Specific champions. Specifically: “champions you expect to play in the jungle”.